In stock. Order in the next 6 hours, 2 minutes and it will go out today! This is just a nice value to purchase dice and playing cards together. 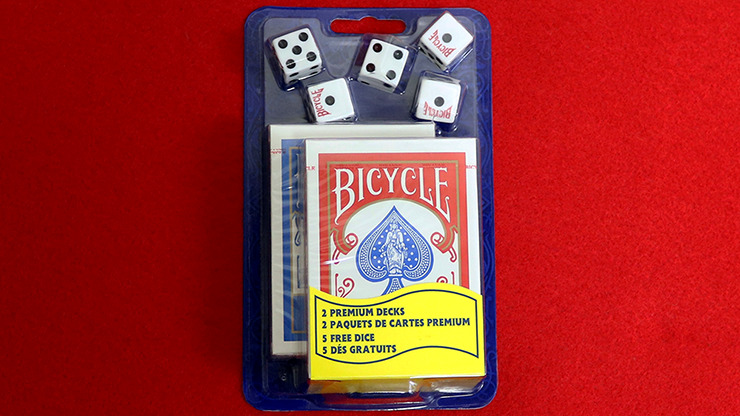 You get a new sealed package of 5 regular Bicycle brand dice plus 2 decks (1 red, 1 blue) of Bicycle 808 Poker Size Playing cards. These are just regular dice for any dice game and the cards are Poker size 3.5" x 2.5" regular index. Perfect for the whole family.